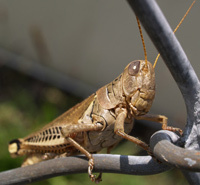 Check out our fun grasshopper facts for kids. Learn about the many different species of grasshopper, how far a grasshopper can jump, how locusts are a type of grasshopper and much more. Read on and enjoy a variety of interesting information about grasshoppers. Grasshoppers are an insect from the suborder Caelifera and the order Orthoptera. Locusts are actually species of short-horned grasshoppers, they often gather in large swarms and can destroy entire fields of crops, because a single grasshopper can eat half its body weight in plants per day. In just the U.S. they cause about $1.5 billion in damage to grazing lands each year. There are around 11,000 known species of grasshopper found around the world, often inhabiting grassy fields, meadow and forest areas. Grasshoppers have two antennae, 6 legs, two pairs of wings and small little pinchers to tear off food such as grasses, leaves and cereal crops. Some species of grasshopper species make noises by either rubbing their back legs against the forewings or body, or by snapping their wings when flying. Grasshoppers grow to around 2 inches (5 cm), with some growing as big as 5 inches (12.7cm). Female are usually larger than males. Grasshoppers are often colored in a way that camouflages them in their local habitat, green ones in grassy fields, sandy colored in dirt and desert areas. Grasshoppers can jump about 25cm high and around 1 meter long. If humans could jump as far as grasshoppers do, relative to size, then we could leap more than the length of a football field. The grasshopper can jump as far as it does because its hind legs act like miniature catapults. It bends its legs at the knee, mechanism within the knee works like a spring, storing up energy. When the grasshopper is ready to jump, it relaxes the leg muscles, allowing the spring to release flinging it into the air. Grasshoppers are commonly eaten in African, Central and South American countries, the insect is a very good source of protein.